Protecting your brand's reputation may be found in the least likely of places within your corporate structure. The silence of your employee's and various departments could be weakening your brand. 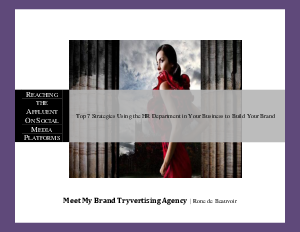 Download Rone de Beauvoir's free white paper from her Tryvertising Agency Meet My Brand for steps, tips and strategies to reach the Affluent through your Human Resource executives and build your brand identity while reaching the Affluent on Social Media platforms.